Benecos is the new kid on the natural makeup block. 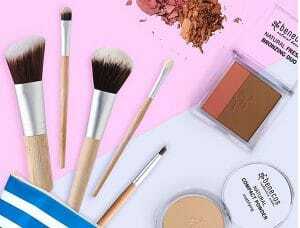 The extensive range includes eyeshadows, eyeliners, and mascaras; lipsticks, lipliners, balms and glosses; blushes and contour powders; compact, loose and translucent powders; BB creams, foundations, and concealers; nail polishes; and vegan brushes. The German brand is BDIH Natural Certified (excluding nail polishes) and uses carefully selected beneficial ingredients. The cosmetic range uses no animal resources in its packaging and is not tested on animals. Many of Benecos’ products are completely free of animal ingredients, including some mascaras, mineral powders and lip balms. The range is also affordable and effective, making it a good option for customers who are looking for a natural makeup range that offers value for money. Products contain no mineral oils, parabens, synthetic emulsifiers, silicones, or synthetic fragrances or colourants. Benecos uses organic ingredients where possible and avoids pure palm oil in its products, instead using palm oil derivatives that come mainly from rapeseed oil. Gemma Kaczerepa is a writer and editor based in Melbourne. She has written across multiple topics including food, travel and sustainability, but has a strong passion for health products and natural beauty.